This classic dessert remains a favorite because of its dramatic presentation, ease of preparation, and delicious celebration of seasonal berries. Named for the famed Russian ballerina of the early 20th century, Anna Pavlova, the ethereal nature of her performance is mirrored in the airy, ephemeral character of the meringue base. 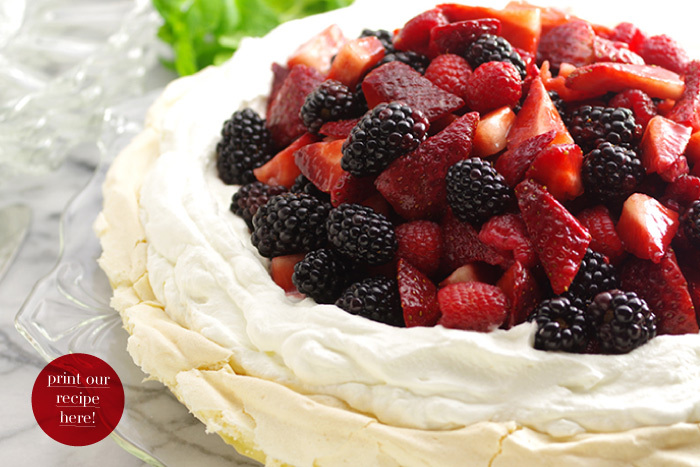 Presented with three layers – the meringue, whipped cream, and berries -- much of this dessert may be prepared ahead of time, then freshly assembled just before serving. 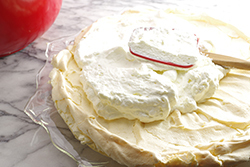 Choose this Pavlova to be one of your signature desserts. 1. Preheat the oven to 200°F. Line a baking sheet with parchment paper or a silicone baking mat. 2. 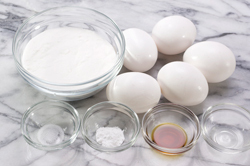 Using a spotlessly clean metal or glass mixing bowl, beat the egg whites on medium until broken up and displaying a foamy appearance. Add the cream of tartar and continue beating, now on high speed, until the egg whites reach the soft peak stage. Add the vanilla extract, almond extract, and salt. 3. 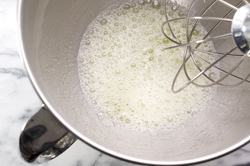 Continue beating the egg whites; sprinkle the sugar on top with the mixer running. The sugar will gradually dissolve as the egg whites reach the stiff peak stage. 4. Dollop the meringue in the center of the lined baking sheet. 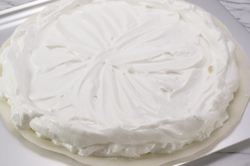 Spread evenly into a 12-inch circle leaving a slightly higher edge to form a rim on the meringue circle. 5. Bake in the oven for 1-1/2 hours or until the outside of the meringue begins to crust and crisp. 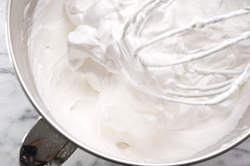 Turn off the oven; allow the meringue to continue to dry out in the oven for several hours or overnight. 6. Near serving time, hull the strawberries, cut into quarters. Wash the raspberries and blackberries; drain well, spread out to air dry. In a small bowl, combine the powdered sugar, lemon juice and fruity liqueur. 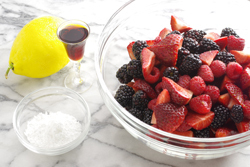 Pour over the berries and gently toss to coat. Set aside. 7. In a chilled, deep mixing bowl, combine the cold cream, vanilla, and powdered sugar. Stir until the sugar dissolves. 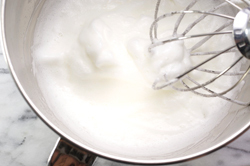 Whisk vigorously by hand, or using the whisk attachment beat in a stand mixer just until stiff peaks form. Do not overbeat. 8. 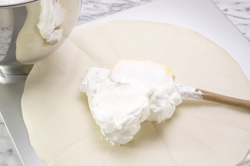 With all three components ready, transfer the meringue to a serving platter. Spread the whipped cream evenly on top of the meringue circle leaving the whipped cream a little higher on the edge to form a rim of sorts. Spoon the berries on top, mounding generously. Serve immediately using your best dessert plates.